One full bath with a multiple jetted shower fixture, built-in TV screens in the bathroom mirrors and a half-bathroom. Sofa, Chair, Dining Area, media center, night stand, dresser, desk, wet bar. 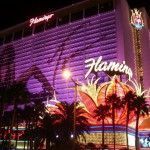 At the Flamingo, Resort Fees are ﻿﻿charged ﻿﻿$30+tax/night and are mandatory.